RIM has unveiled a new contactless content-sharing system for NFC-enabled BlackBerry smart phones, according to Silicon.com. “BlackBerry Tag” will enable users to share contact info, documents, URLs, photos and other media by simply tapping their NFC-enabled BlackBerry handsets together. 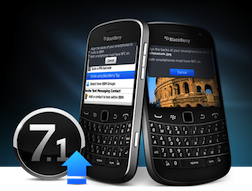 The service will also connect to BlackBerry Messenger (BBM), allowing users to tap phones to add each other as friends. RIM currently offers two NFC-enabled BlackBerry phones that will support BlackBerry Tag: the Bold 9900 and the Curve 9360. RIM also announced plans keep BlackBerry Tag open to third-party software developers, enabling them to add NFC sharing technology to future apps, according to Silicon.com.